Looking for a beautiful holiday cookie that tastes like a treat but will leave you and your kids feeling good, even hours after you eat it? This, my friends, is your cookie. © Copyright Michael Goran and Emily Ventura, 2017. Unauthorized use and/or duplication of this material without express and written permission from this site’s authors and/or owners is strictly prohibited. 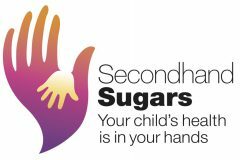 Secondhand Sugars™ is a registered trademark of Dr. Michael Goran.